I have plenty of Evernote notes that I need to organize in my daily life. I also own a windows computer, the latest iPad, and iPhone. 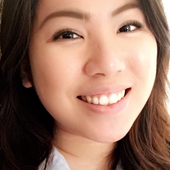 I clip articles with ranges of different topics such as digital marketing to WordPress. 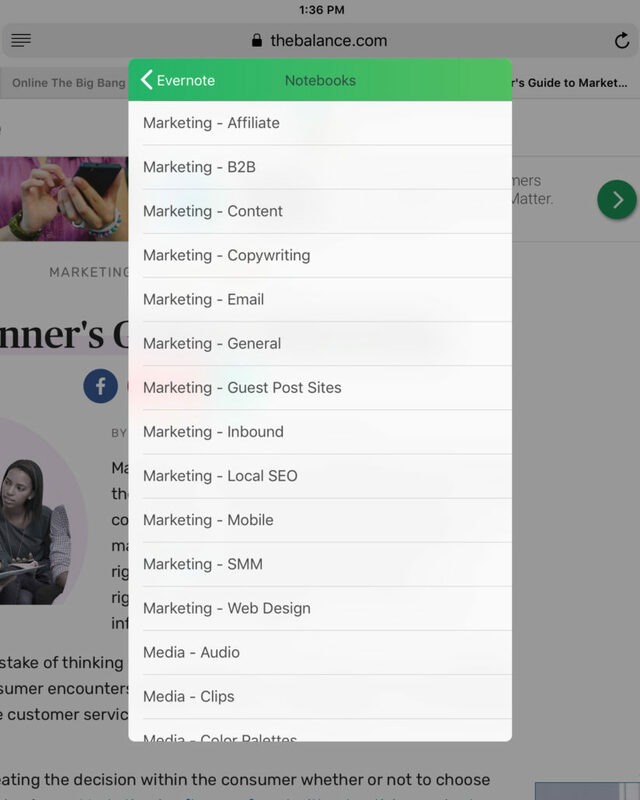 I get articles from Feedly, or I use the regular Evernote clipper chrome extension. I’ve been using Evernote since 2008, and back then, Evernote was simple. It now has evolved into something I can’t live without as more features are being added. 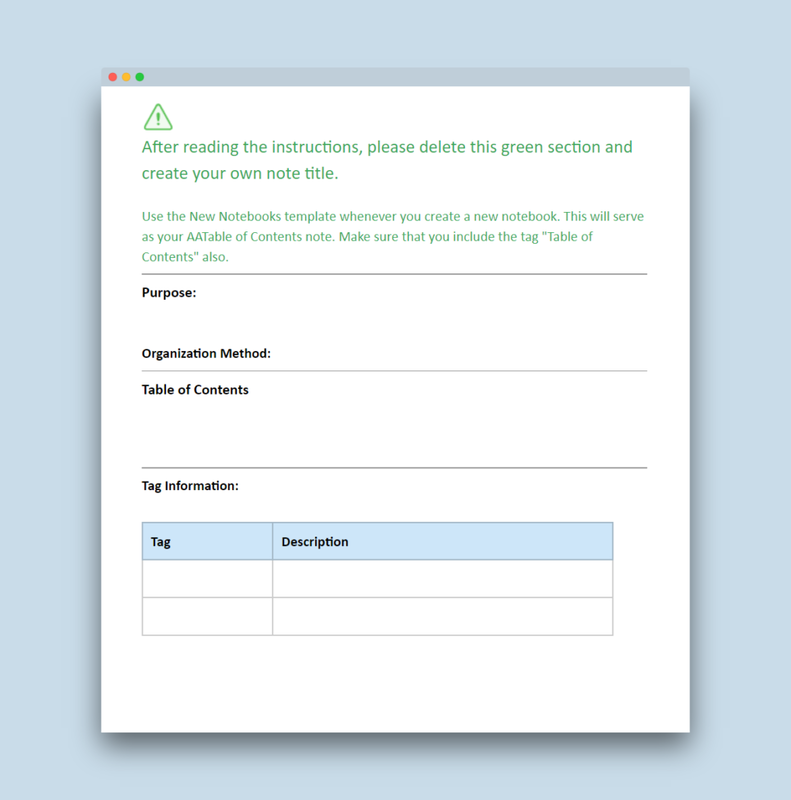 Evernote is simply a generalized notebook system. It’s up to on how you use it based on your needs. The way my brain works is this: I always have a different urge to organize all the things I have in my life through categories. I like seeing these categories in front of me because I can’t always remember the source of what I need. I can only remember what I’m trying to do if it’s right in front of me. Here is another analogy: There are people out there that if they forget their grocery list, they go through every aisle in the grocery store. That’s just how my brain works. Categorize (AACategorize) – a place where I dump all new notes and clippings. Ideas (AAIdeas) – Ideas I have randomly throughout the day. To do (AATo_Do) – notes that contain things I need to do. Each of these notebooks has the letters AA at the beginning so that they shoot at the top of the notebooks list. All these notebooks are in one stack called AAStart Here. You can name your notebooks however you want. Here is the link to my Table of Contents Template. 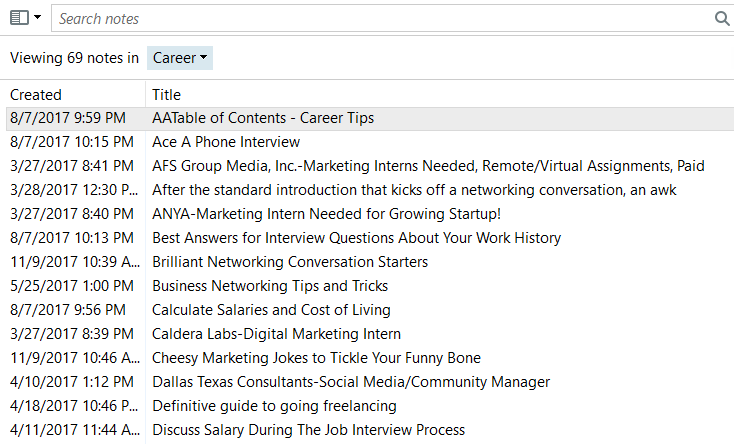 Evernote used to have their version of Table of Contents template, but sadly, they took it down. Purpose – usually just one sentence. Examples: To keep all my notes from MGMT 302 in one place. Organization Method – I put either one of the three: (1)by alphabetical order, (2)by date, (3) by links. Table of Contents – contains all the important links of the notes. Tag Information – How I organize tags in the notebook. The title helps me, as it stays up to the top of the list when I put them in alphabetical order. Whenever I search for a note, I search for it on the table of contents to check if I have saved the link or I sort my notes in alphabetical order. There are times we have to do research on a particular project or have a notebook with its main purpose is to collect articles from all over the internet. 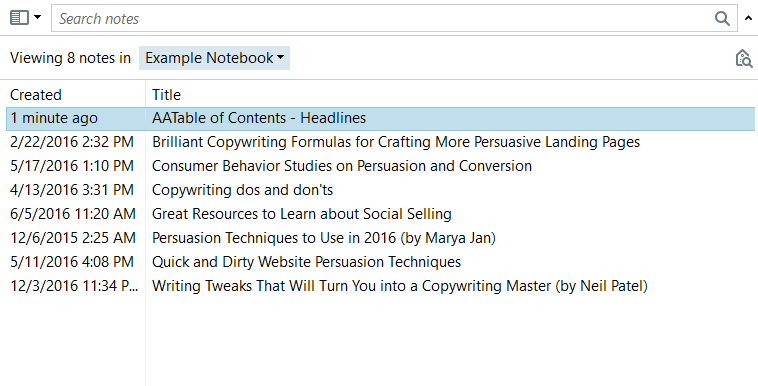 I used to have a massive, unorganized notebook filled with articles with different titles which don’t seem to reflect the content for each of the note as they are “optimized” to be click-worthy. In using the Evernote Web Clipper, I edit the title to reflect what the article is about. Like I mentioned before, I may not find what I’m looking for if it’s not right in front of me. This means that there needs to be a considerable amount of things in front of me, but I make sure that I’m not overloaded with data. Think of it as an entire a bookstore. If you enter a library, you’ll see that each book on the shelf is closed so you cannot see what’s on the inside. If every book were open right in front of you when you walk in the bookstore, would you find what you’re looking for? That’s why, my view only shows the notebook name, date created, and title. This view is called the side list view. My view is side list, with columns Created Date and Title respectively. I tend to put all my notes in alphabetical order, so I make sure none of my note titles have a number on it. Leaving notes that begin with a number will shoot them at the top of the list whenever I put them in alphabetical order. What it looks like in alphabetical order, without editing the titles. I can’t organize it because it starts with a number. Why do I rewrite them that way? I rewrite them that way to not stress out your brain. Now it looks a lot cleaner. I name my notebooks with the stack name, dash, the name of the notebook. Marketing is the name of the stack. 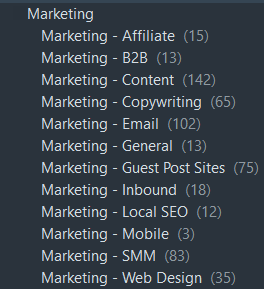 Within those stacks, I have Affiliate, B2B, Content, Copywriting, Email, General, Guest Post Sites, Inbound, Local SEO, Mobile, SMM (Social Media), and Web design. The reason why I put Marketing then a dash is so that it’ll be easier for me to find them when using other applications. Other applications don’t show your stacks, unfortunately. You can, however, put it on the AACategorize notebook if you’re in a hurry. I hope this blog post helps you organize your Evernote notebooks and notes. If you haven’t gotten the chance to switch to premium, I would recommend that you do as Evernote has helped me organized my life. How do you organize your Evernote? I’d love to learn how other people organize theirs. Let me know in the comments section.